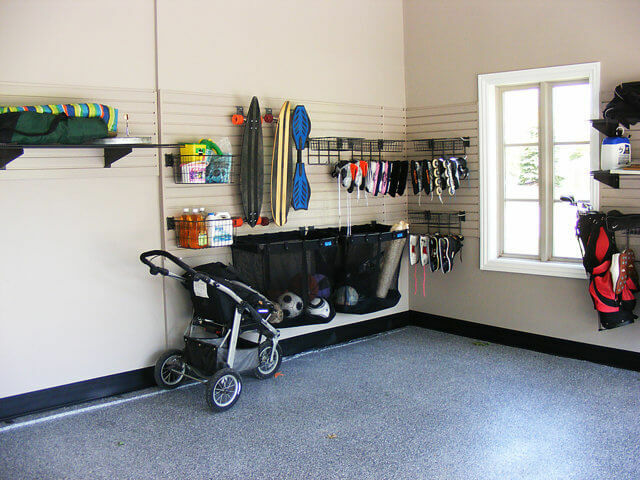 We’ve talked about purging your garage and getting rid of what you don’t need to keep; now it’s time to think about how to organize what’s remaining. This is when you really need to reflect a little on your storage personality: Is it open or closed? Take a look at your kitchen. Do you have open shelves with items stored neatly on display? Or is there a disaster lurking behind the closed cupboards? You might try to keep things neat and orderly, but maybe you’ve got teenagers who sabotage the organization. The same thing can happen in the garage. When we organize, we have the best of intentions to keep everything neat, but life gets in the way and we fall into old habits. You need to look at the way you live your life and find a storage plan that fits every member of the family’s storage personality. 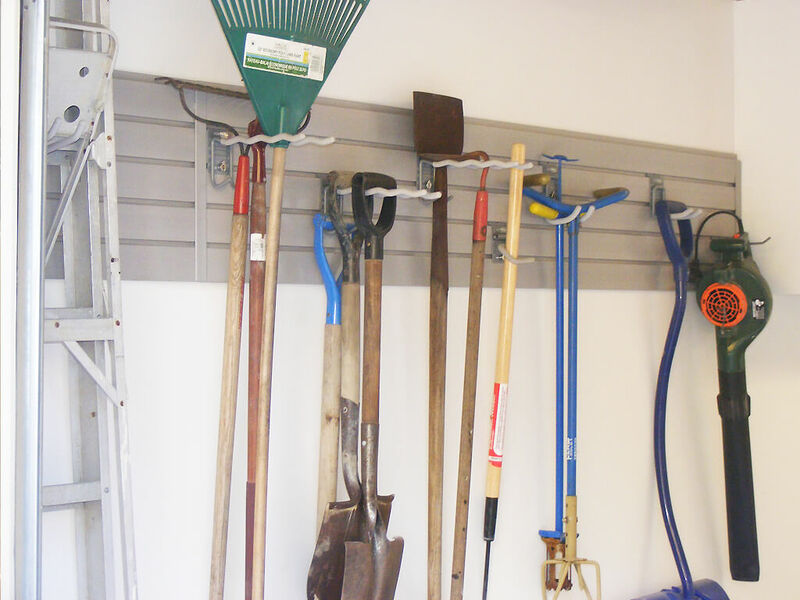 With spring arriving, if you’re an avid gardener, wouldn’t it be nice to be able to walk into the garage and instantly find those pruning shears that always seem to disappear over winter? And you need a place to keep tools, soil, fertilizer and other gardening items. 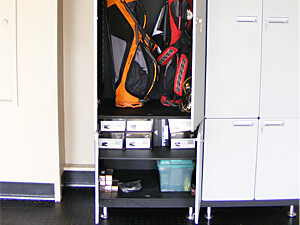 If you’ve been skiing all winter and now your thoughts are turning to golf, you’ll need a convenient place to store your equipment and switch sports with the seasons without a lot of effort. 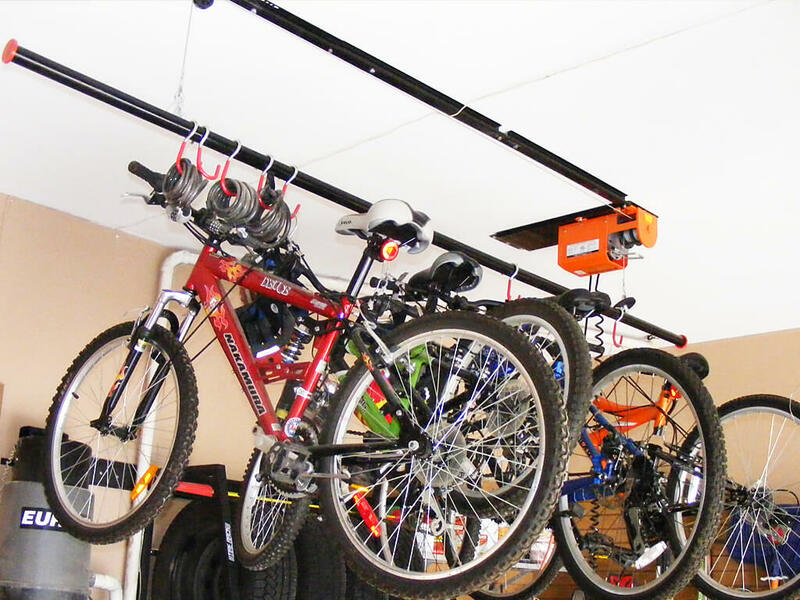 If you’ve got kids, You need a way to keep their stuff organized while keeping them safe when they’re you need to think about them running in and out of the garage with their bikes, toboggans or looking for toys. This calls for different types of storage solutions. To help you decide what will work best for you, let’s look at open shelves versus closed cabinets and the advantages and disadvantages of each. When you think about things looking tidy, a cabinet with doors sounds appealing. Closed cabinets can work well for organizing in a garage. If you have small children, cabinets with locking doors,to keep small hands from being able to reach for toxic chemicals such as fertilizers and cleaning solutions, is a great solution. A cabinet with drawers is handy for storing small tools for the exotic car guy or DIY-er of the home so they can enjoy a professional-style environment in the garage.There are also tall, locker-style cabinets with shelves above and an open area below to store long tools or golf clubs. Storing everything in closed cabinets give an overall clean look to a garage. But do they really keep you organized? Unless you’re naturally organized (and can train the rest of your family to be the same), things that are hidden can end up messy after a while. And you’ll be paying a premium to hide all your stuff. 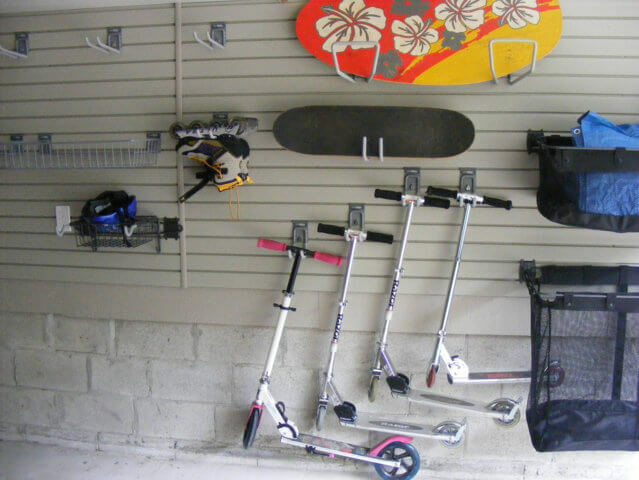 You might think that storing things in the open in your garage would make it look messy. But using the right sort of open storage system can actually help you get and stay organized, and potentiallymake it easier for younger members of the family to participate in keeping the space neat and organized. 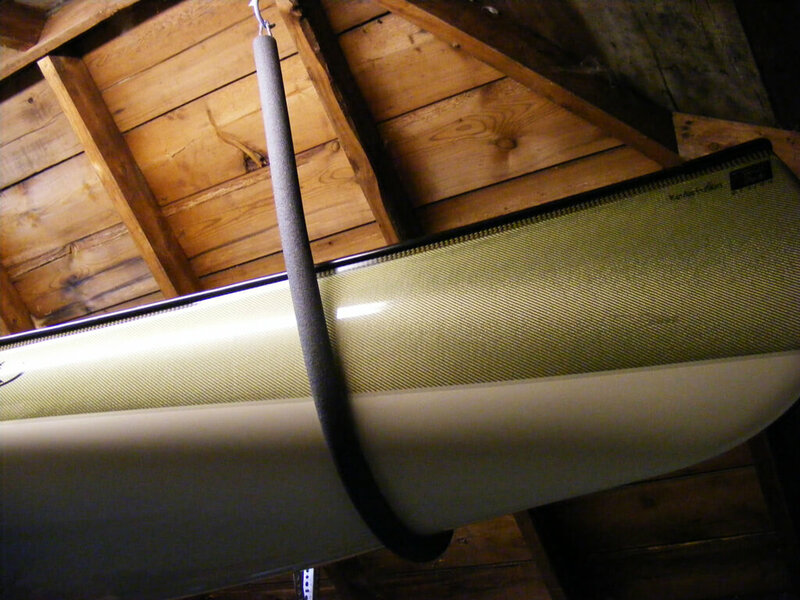 Hooks have a defined purpose and if you take a tool down from a hook, it’s easy to hang it back in its place when you’re done using it. 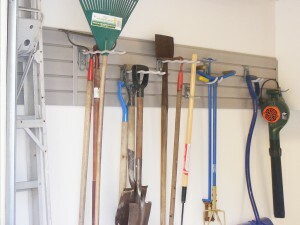 If you’ve started by sorting your garage items into groups, you can then attach baskets and hooks to slatwall. Car cleaning items such as chamois, sponges and soap can go in a basket where they are easily accessible. Kids can have easily accessible baskets for balls, skipping ropes and water toys. Their bikes can also be placed on hooks low down. They’re more likely to put stuff back if it’s got a specific home. Open shelving or platforms can be placed higher on the walls or hung from the ceiling to neatly store seasonal or seldom used items away from eye level. Closed cabinets look a little neater at first glance, but open storage might keep you more organized. It’s also a less-expensive option.